Euro Truck Simulator 2 and Blender2SCS – What is the Right Scale? A question that boggled me for ages was how to make sure objects are scaled properly for ETS2. I asked and asked and asked on forums and always got the same answer: “Just import a default trailer and use it for reference”. It amazed me that so many people were content with just using a rough draft to approximate things. I want realism, and precise scale is the ONLY way to simulate realism at all. Approximating does not cut it for me. Yikes! That is huge. 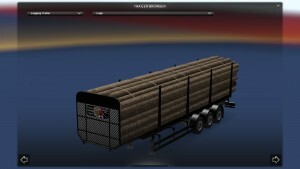 Double the size of the default trailer (seen in the image as the smaller object). Wait . . . double the size . . . . that’s it! 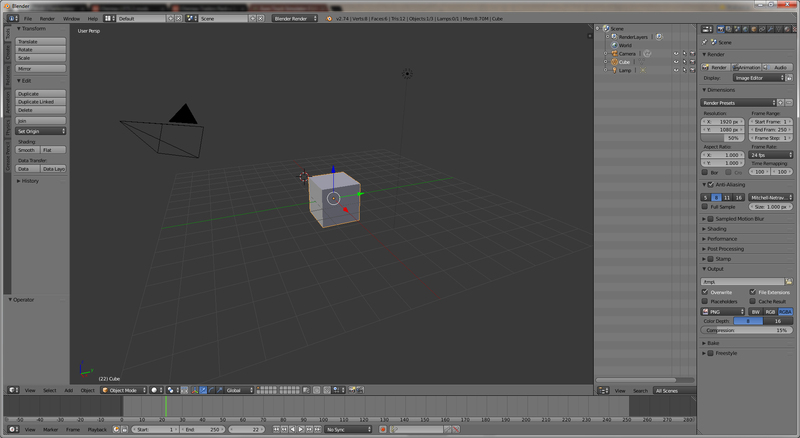 So I created a new cube and this time paid attention to the grid lines. Each grid line in Blender is 1 meter, but the new cube by default is 2 lines wide! 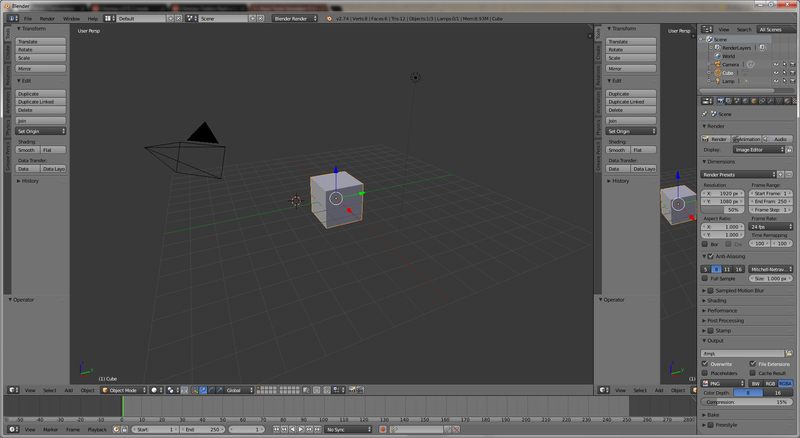 So, at least in my version of Blender which is v 2.74, a new cube is 2 meters in each direction, not 1! So now, entering those numbers on the new cube, we get a model that perfectly matches the default SCS Profi Liner. AWESOME! So now we know how to precisely scale an object to ETS2. Now I will leave you guys with an important note: DO NOT apply location and transformation until you are satisfied that your object is to scale and positioned properly. Once you apply location and rotation, the scale “resets”, so if you find you messed up on the scale after the fact, you would have to create a new cube, sphere, etc. and start over. I hope this helps others who might be Googling for this same issue. Good luck with your new model! 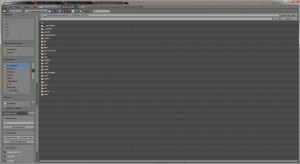 So this will be my first all-out detailed tutorial for ETS2 modding. Before I go into the article, I want to make a disclaimer that I do NOT consider myself an expert in the area of modding. Like you, I am merely a beginner, and learning all of this process myself. I practice in the areas of 3D modelling, texturing, and some definition file tinkering for tweaking the simulation environment. As such, I always welcome feedback, as long as it is constructive, so feel free to let me know if you have any comments or suggestions on the following article. As usual with the majority of simulation enthusiasts in the world, it does not take me long to tire of the boring default vehicles available in Euro Truck Simulator 2. Even re-skinning them only kept me appeased for so long. I wanted some beautiful trailers, and I wanted a fleet for my virtual company. 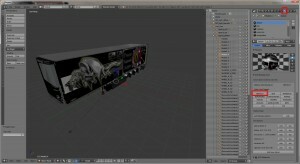 I am also a heavy user of the famous Jazzy packs which add a WONDERFUL array of AI traffic and trailers to the game. So I thought to myself, "With all of these wonderful Jazzy packs, do I really want to sit around coding DEF files for standalone trailers? Or shall I just replace the default trailers with my own fleet?" I had to weight a couple of options. The Jazzy fleets obviously repaint the default trailers as well, so I could just make my own standalone fleet in addition to the already available real-world trailer choices. However, if I replace the default trailers with my own customized fleet, then all I have to do whenever an expansion comes out is make sure the trailers are still up to par as far as wheel definitions go. I do not have to worry about changes in definition standards across the board – something I encountered when 1.14 released. So for my current profile for ETS2 I decided to go with the replace-the-default-fleet route. For this project, I take a third party trailer and re-skin it to my fleet colours. This tutorial is not a painting tutorial, so we’ll start with a trailer that is already skinned to my satisfaction – in this case the wonderful Chereau. 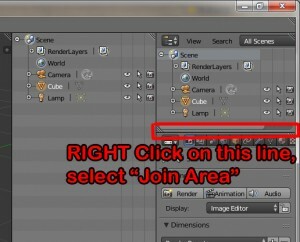 You may easily follow this tutorial using ANY trailer of your liking. If you are at a loss for a trailer, or simply want to follow the tutorial with the same trailer I use, then here is how to get hold of the Chereau. Now we need the software to prepare for modding. 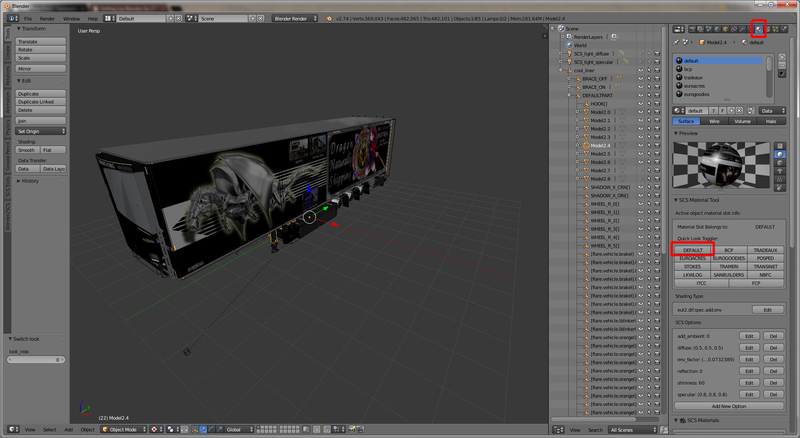 Again, this is NOT a paint tutorial, so I will not go into software for skinning the trailers. For this project we will assume you have already downloaded the above mentioned trailer, and painted it. 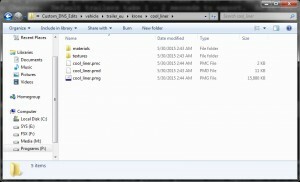 In order for us to mod anything at all for ETS2, we always need to have all of the game files available. 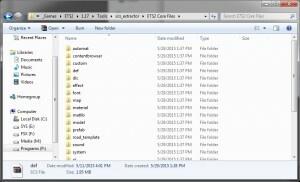 Fortunately, the way modding works for ETS2, we extract the files separately and work with them separately, so we can work with the core files WITHOUT messing up our game! 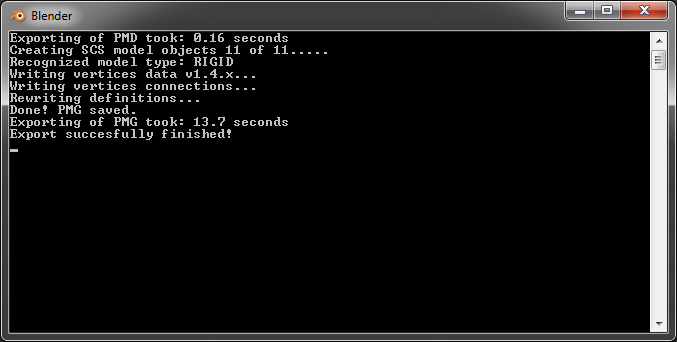 As such, the current game engine set-up should never require a reinstall due to a mod going bad. Any time a game mod goes bad, simply deactivating the mod will usually fix the issue. Obviously, some advanced mods that affect maps or core game files may mess up a profile, but they will never mess up a game so badly that it forces a reinstall. The worst case scenario is you might have to start a new profile. There is no install for this program. 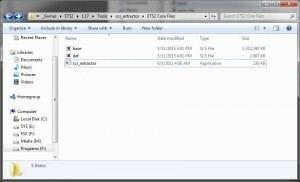 It is simply an exe file named "scs_extractor.exe". You simply extract the tool and use it. I will tell you how to use it in a few moments. Your next step is to decide where you will work with your game files. It is very important to note that you need, at the time of this writing based on file sizes, at least 1.6 GB of disk space to safely work with your modding. At this time, there was 1.51 GB involved in the needed files (don;t worry we’re getting to those in a moment), and obviously modding will take up more room, and I figured 10 GB would be sufficient for this project. I do a LOT of modding and also download and install a ton of mods and currently have only used 3 GB of this space, so you should be well okay as long as you have 1.6 GB to work with in disk space. 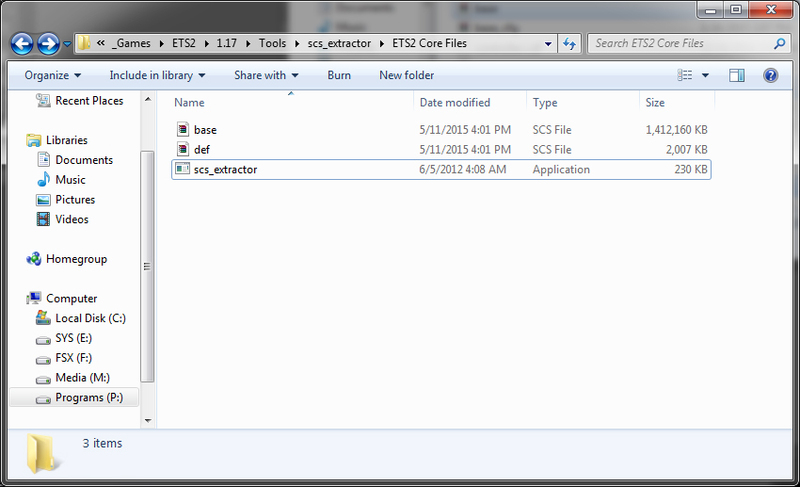 What I did was create a directory called "ETS2 Core Files" and placed a copy of "scs_extractor.exe" in this directory. Now is where it gets tricky, because different launcher users will have different directories for ETS2. Thus, the information I am about to give WILL be different if you are not a Steam user. I use Steam, and this makes accessing the game directory pretty much easy and brainless. 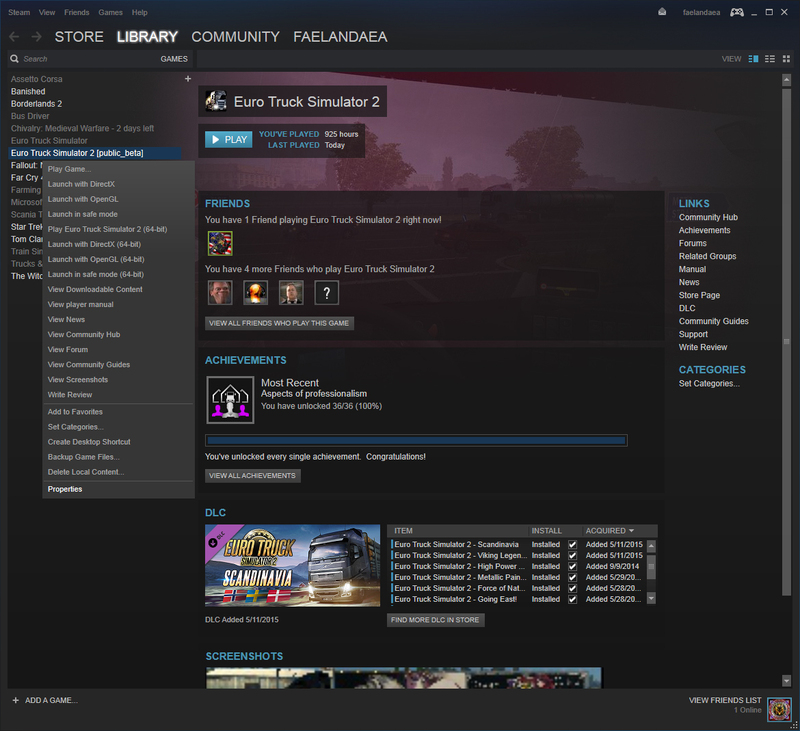 In your Steam library, simply right-click Euro Truck Simulator 2 and select "Properties". In the window that pops up, select the "LOCAL FILES" tab at the top. Now select "BROWSE LOCAL FILES…" This will open your ETS2 directory. 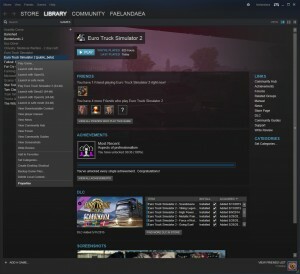 In my case it was C:\Program Files (x86)\Steam\steamapps\common\Euro Truck Simulator 2, but it may vary depending on the options you chose when installing Steam and installing Games. Now we need to extract these files. 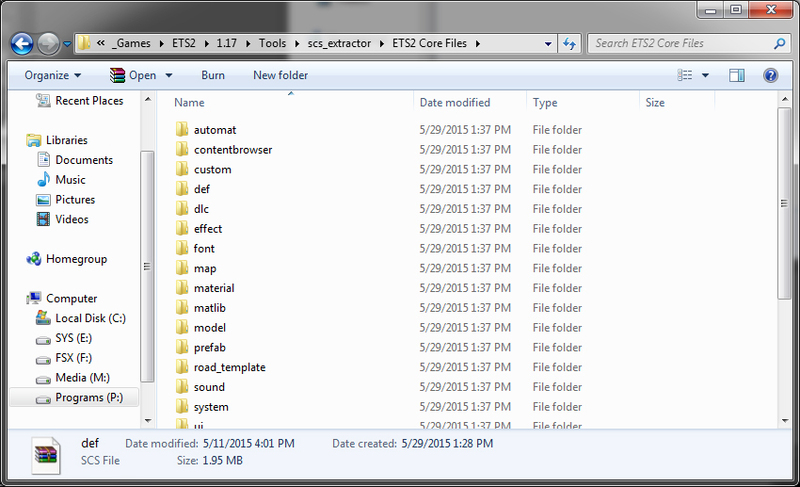 To do this, simply DRAG each file (one at a time) onto the "scs_extractor.exe" tool and wait. A black CMD (DOS for those of us old school folks) window will pop up letting you know it is processing the work. My advice is do the def file first, then the base file. The base file will take anywhere from 30 seconds to a few minutes to extract, maybe even longer depending on your computer’s processing speed. 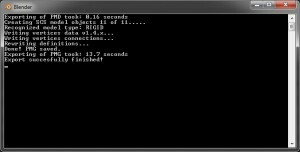 But if you are running a PC meant for gaming, it should never take more than 2 – 3 minutes tops to extract the base files. The def directory should always take only a few seconds, as it is only a bunch of text files. That is why I do it first, then go grab a quick drink while base is extracting. The game files are now prepared for working with. Leave them for now and lets move on. I am currently running WinRAR x64 (64 Bit) 5.21. It’s an installer so you should have no problem installing it. There is a paid version of WinRAR but do not worry about this. 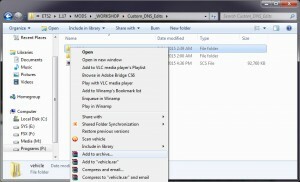 To access SCS files and work with them, we only need the free tools. The paid version is really just for advanced features and tech support. Now for Blender. 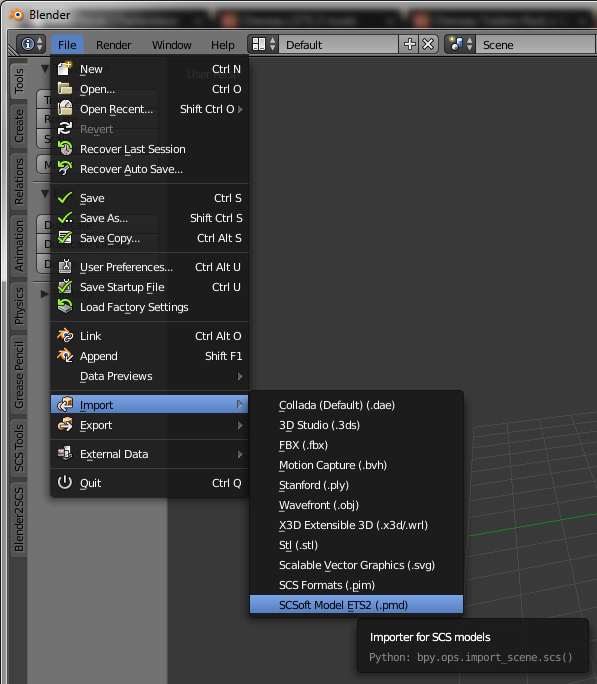 We will need this, as well as a plug-in used for editing SCS files. 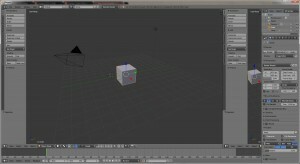 I had originally had this as part of this tutorial, but in my typing, the instructions for setting up Blender became so long, that I snipped it and turned it into it’s own article. 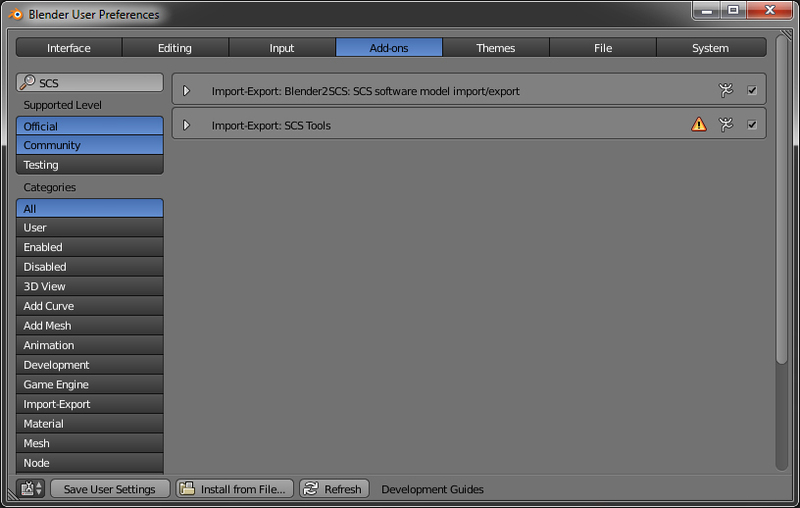 Before you can proceed with this tutorial, you will need to have Blender and Blender2SCS installed and configured. You may follow the link to go through that process, then come back here to continue. 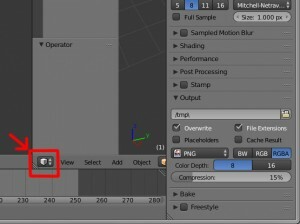 Honestly, I think setting up Blender took longer than the entire conversion process of this tutorial alone, so set asi=de some time before you dive into the setup process. I have multiple monitors on my PC. This is not only awesome for gaming, but VERY VERY handy for modding as well. However I understand that a lot of people still use a single monitor for editing. We will be using 2 instances of Blender for this project, so what I suggest is not having them maximized. 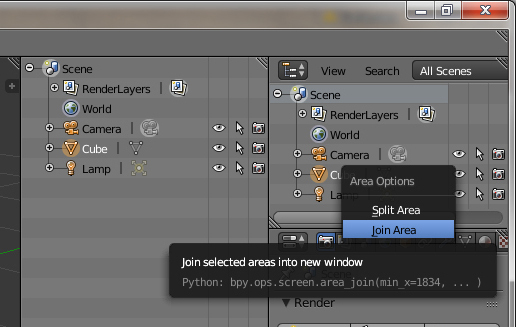 Instead, open both instances of Blender so that they are side by side, each taking up half of your screen. Our reason for this is, in order to properly replace a default trailer without errors, we will have to duplicate a lot of information from the default trailer onto our new trailer. 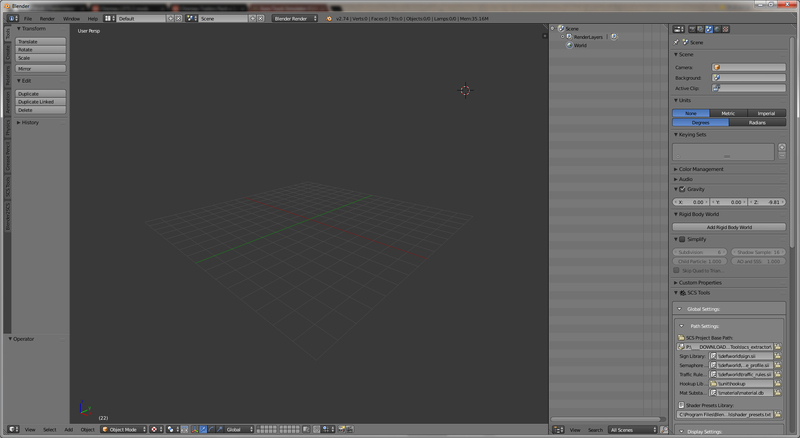 So go ahead and open Blender TWICE, and resize them so they are side by side, and then lets continue on. 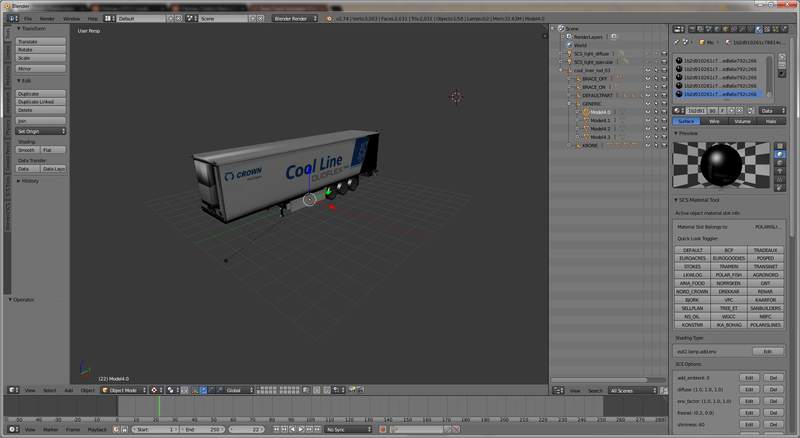 For the sake of this tutorial, I will be replacing the Krone Coolliner with a Chereau trailer. However you can use any trailer combination you like. 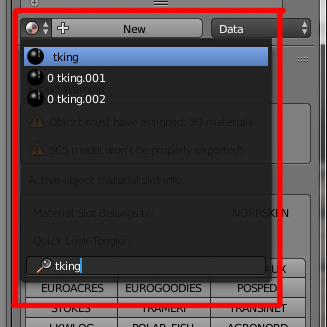 Once it is imported, you should see something like this (note I have the cool_liner tree highlighted and the "Object" tab selected in the properties window on the right). This model we are only using for reference, so let’s move on to our custom model. I presume that you have already followed the earlier links and downloaded the Chereau trailer. Or, if you are using another trailer, you have it downloaded. Again, the steps I take are for the Chereau but the concepts will all be the same. Go to the folder where you downloaded the Chereau, which should be "Pack Chereau V1 by Vaay1999". Extract the files in that folder. You should now have "zzzzzzzzzzPack Chereau.scs". If this is your first time messing about with an scs file, most likely it is just a generic white icon with no program associated with it. This is normal. 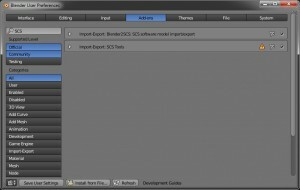 A little bit about scs files and their format. 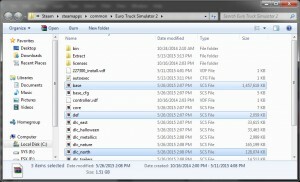 An scs file is, quite simply, a zip file that was given a different extension which is used by ETS2 to see it as a mod file. So, when you double click to open this file, it should bring up a dialogue window to have you assign which program opens it. Choose WinRAR to open the file, and make sure you select "Always use the selected program to open this kind of file". You may have to navigate to the program manually. By default WinRAR is installed to "C:\Program Files\WinRAR". Just navigate there and select the WinRAR application. A little bit about mod security. Some modders do not want the community to be able to customize a mod to their own enjoyment (a pointless idiocy, but that’s a debate for an entirely different article). 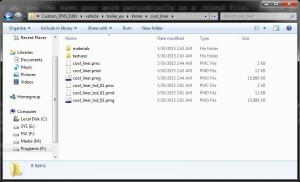 The point here is, sometimes you may open a mod and notice the folders inside it have an asterisk symbol (*) next to it. This means that the mod is locked and cannot be extracted . . . easily . . . there is a program to still open these types of mods, but again I’ll cover that in another article. 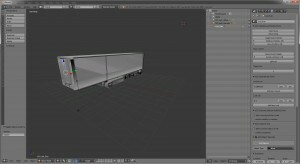 Use different skins downloaded from different Chereau trailer downloads to apply to this project (given that the skins are the same UV mapping as the one this trailer uses). Create your own skins, making each a different variation for each look – a lot of modders doing a single company fleet will make a simple change like the trailer’s serial number markings, etc to give an in-game look of a whole fleet of trailers for one company. Use the same texture on all looks to give a universal look for your fleet of trailers, essentially turning the Cool-liner into a single trailer. For the sake of this tutorial, we will make things REALLY simple and use option 3, using the same texture on the entire fleet. I happened to paint a skin I will be using for the Chereau, and will use it for this tutorial. Now let’s bring in the new trailer. 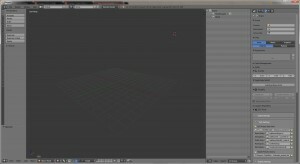 We will use the second instance of Blender to do this. Now is where we get to use ‘Set as Mod Path" individually. 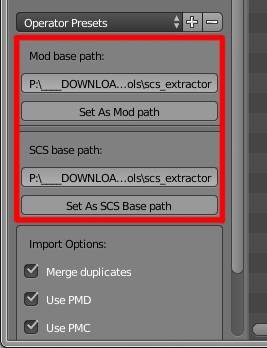 You still want to "Set As SCS Base Path" to your original game files where you extracted them using scs_extractor. However, now your mod path should point to where you just extracted the Chereau core files. Originally, this trailer was originally intended to already replace the cool-liner, but it is imperative that you know and understand that the name of the pmd is ALWAYS the name of the top tier of your directory tree. Let’s take a look. 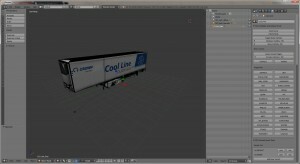 See how in the screen-shot here your trailer is named "cool_liner"? Say we want this trailer to NOT replace a default trailer in the game. We simple name this to something else, such as my_trailer. If we change that name to "my_trailer", then the model will export automatically as my_trailer.pmd, my_trailer.pmg and my_trailer.pmc respectively. For now, though, let’s leave well enough alone and move on. Our first step is to assure that the variants of both trailers match precisely. In the default Krone trailer, we have two variants, "DEFAULT" and "KRONE". Our new trailer only has "DEFAULT". Let’s make a KRONE variant. 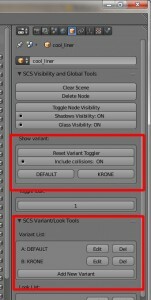 Look down to where you see "SCS Variant Look/Tools" on the right side of Blender. You see a Variant List that already has "A: DEFAULT" listed. Click "ADD NEW VARIANT", then replace "NEW_NAME" with "KRONE". Click OK.
Now, in your Outliner, click DEFAULTPART to highlight it. 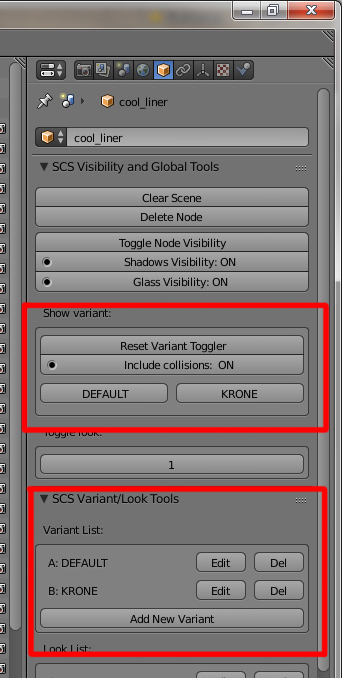 On the right side, "SCS Section/Collision Visibility Tools" should now list your new Variant, but with it unchecked. Check this. Now for the time consuming part. Looks. ETS2 has 30 different looks for the Krone Cool Liner alone. The list goes up to "29", but that is because the first look is labeled as "0", so 30 looks are there total. Click and highlight cool_liner again, so that you can see the looks list. As you can see, we only have one look, titled "1". 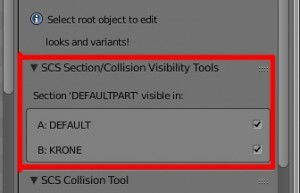 Now look at the "SCS Variant Look/Tools" section and click "EDIT" next to "0: 1" in the looks list. Change this name to DEFAULT. Click OK. Now, keep looking at the same list on the default trailer, and keep clicking "ADD NEW LOOK" to add the looks from the default fleet. SPELLING IS CRUCIAL HERE!!! Use copy/paste if you need to. What I did was on the default trailer, selected the look I was copying, clicked "EDIT", coped the text, then pasted it to a new look on my Chereau. Once done, the lists looked the same for both trailers. Now it is time to apply your skin to the trailer. You may have done this already manually by painting over the original paint in the original texture file, but I like to always keep files clean in case I decide to go back for whatever reason. So I painted my own file and named it something unique so as to not overwrite existing files. 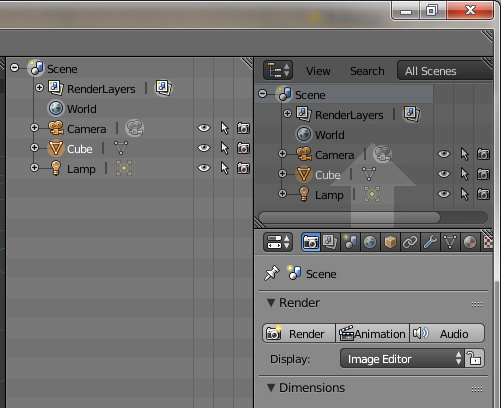 So what I did here was click on the Materials tab at the top, and on the "Quick Look Toggler" I selected DEFAULT. Then I clicked the TEXTURE tab at the top, selected "default", then on the "image" section below, I clicked the folder icon to navigate to my custom texture. Now I should be seeing my desired skin on the trailer. Awesome!!! Or maybe now. The skin may not look right, some elements might need moved, etc. The COOL part is you can use Blender to apply a skin like this and then make corrections to your paint in your editor of choice, then all you have to do is hit REFRESH (see screen-shot below) every time you save the texture to preview the changes instantly in Blender!!! No more starting ETS2 50,000 times to correct 3 pixels of movement somewhere!!! Oh but I bet you are seeing a bunch of odd grey or black covering your texture, right? Right. Those are shadow textures rendered solid here but the game sees them as mostly transparent. We can get those out of the way. 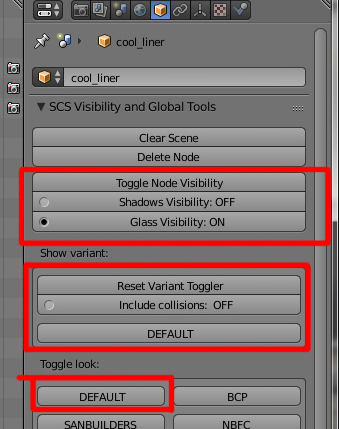 Simply click the OBJECT tab, then select SHADOWS VISIBILITY OFF. now you should be able to see the skin without issues. The black lines you see are collision boxes in front of the skin. If those bother you, just expand the "collisions" part of the trailer in your Outliner tree and click all the eyeballs until they are greyed out. No more boxes. You can also hide collisions by highlighting your root model name, click "INCLUDE COLLISIONS" so it reads "OFF, and then reset the variant toggle, then reselect DEFAULT. Now you see the trailer with nothing but flares and physical parts. You can hide the flares too, but I have never bothered with this as those have to be clicked individually and trailers like the Chereau have a LOT of flares. besides, they never get in the way anyway. So . . . now we have a skin applied, and most likely you stopped there to make a few corrections on the skin, with a smile on your face that you just saved a lot of skin editing time, and now you are ready to export this beauty and get into game with it. Well, we still have some work to do. Don’t hate me. 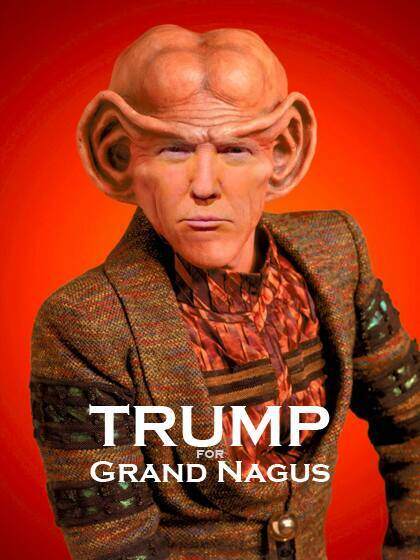 I’m just the messenger. Do you remember earlier when we assigned a bunch of "Looks" to the trailer? Mainly they were abbreviations for all of the fictional companies in the game. These are essentially call-codes. 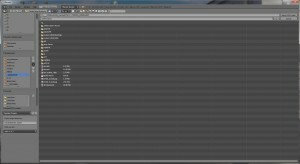 Even if you have a third-party mod that changes company logos and graphics to real-world companies, ETS2 still refers to the default names in various files to properly call upon and assign assets to those companies. Have you ever wondered how the game knows to put Eurogoodies trailers at, say, Eurogoodies? Well, now you know. ETS2 communicates with these codes you just assigned to the model, and then calls upon the assigned texture to that look to display the proper paint at the proper location in the game. We created the codes, but guess what – each of those codes needs it’s own material assigned so that each can have a texture. 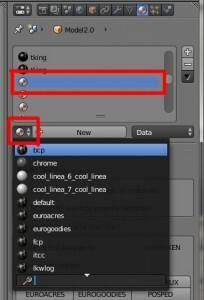 Lets expand "cool_liner" in the outliner window, then expand "DEFAULTPART". 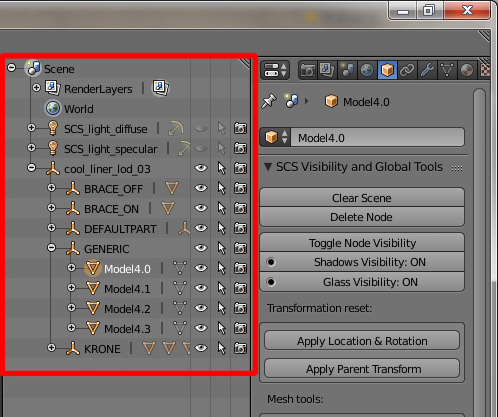 Now click to highlight "Model2.0", and click the "Materials" tab of the properties window. Blender2SCS is telling us this is an issue, and tells how how many materials we need to have – in this trailer’s case – in order to have a proper export. 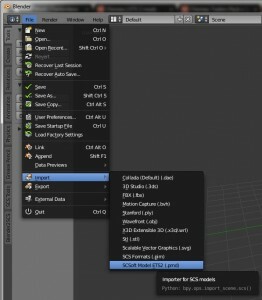 If we do not get these materials assigned, Blender will not even complete the export and we’ll have nothing to put into a mod. For the most part, with the exception of the part of the trailer that uses your custom skin, fixing this will be VERY easy. In the case of the currently highlighted part, for me "Model2.0" is the Thermal King refrigerator. Having this as an independant unit is cool, because if I wanted to, I could create new textures for the original white variant of the fridge and have them randomly tossed in here so I have trailers with both colors available in the game. I did this for the Reefer, actually. 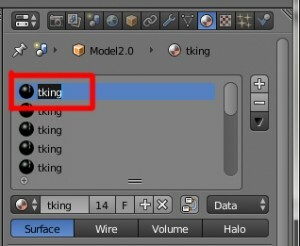 But for the purpose of this tutorial I’ll stick to one texture. 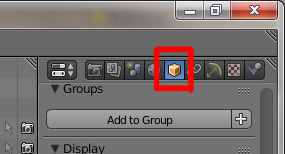 Double click to be able to edit the name of the material. Dont change the name unless you really want to. Just copy the text (CTRL+C for Windows users). Now, look just below that list. You should see a number which indicates the number of materials that already exist. In my case it’s 14. I need 30, so 30-14=16. I need 16 more materials assigned to this part. Now here is where it gets a bit annoying. 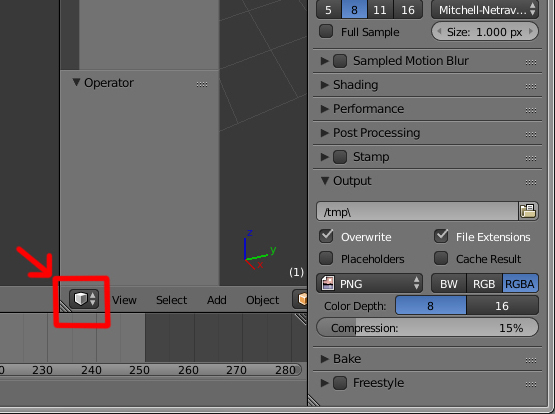 At this current time, Blender does NOT give the ability to copy/paste an entire material from scratch. Duplicate material I think would be what they’d call it if such a feature existed. So we have to one-by-one create each material ourselves and one-by-one assign the current material to each one. Creating the materials is the easy part. 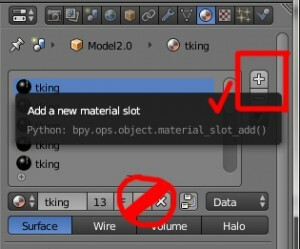 Since we need 16 more materials, I simpy click the "+" to add a new material 16 times. IMPORTANT: There are two "+" signs. The one we want is the one circled in the following screenshot. 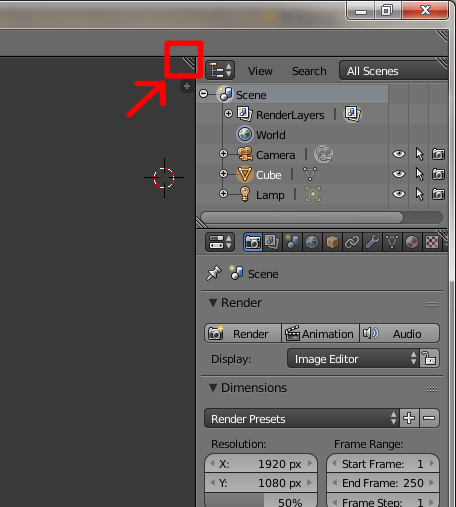 If you are a neat freak like me, you can simply hit the "-" to delete that material slot so the error goes away. You may notice in my screens hot that I have three results which hopefully you do NOT have. Remember above when I said NOT to click the wrong "+"? This is because I have no clue what this does, but it seems to create some additional copy of my material and adds a .001 to it. I imagine this is so you can essentially rename such a material and use it for other textures or something, looks maybe. But once you get these duplicates, they can never go away. You cannot delete them, so while it doesn’t HURT anything to put them there by mistake, to a neat freak like me they are annoying. Try to avoid it. Regardless, just click on tking and then notice that the material and all of the properties of that material are added to your new blank slot. Now for the fun part . . . REPEAT a LOT. Repeat this process 15 more bloody times until you are done. once you are done, the warning triangles should disappear. if they do not disappear, you may have missed a material in the list or need to add another. Make sure all materials are accounted for until the warnings disappear. Are you annoyed yet? Guess what. That was just ONE part of the trailer. Once you get to a model for your custom livery, in my case "Model2.2", 2.3, 2.4, 2.5, 2.6 and the BRACE parts, you will notice that instead of a bunch of the same material being applied, you now have a material for each company. THIS is where you can assign a different paint for each company, and THIS is how the game sees and assigns a particular trailer to that company. Since we are creating a SINGLE livery for the entire fleet, you can essentially copy/paste "default" to all of the other slots, overwriting the current companies and filling in the 16 new ones you need to create. I’d go into how to create new materials and start assigning them all the details needed to apply a texture, but that process is long enough to need another entire tutorial for. I’ll try to cover that bit this summer for everyone. Ah, yes, and remember how we selected "Shadows Visibility: OFF" earlier? 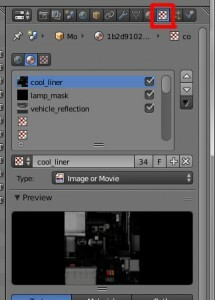 We can;t add/edit materials when something is hidden to us, so we need to click the little eyeball to make these layers visible at least while we do the edits. Once done, we can always click them back off again so we can see our paint fully. 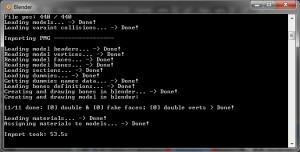 By now you have probably repeated this process on all of the "Model" parts under DEFAULTPART. The good news is ONLY parts named "MODELx.x" (where x.x is the model part number) need to have materials assigned. 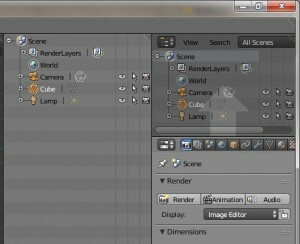 All other parts are effects only and need no textures. 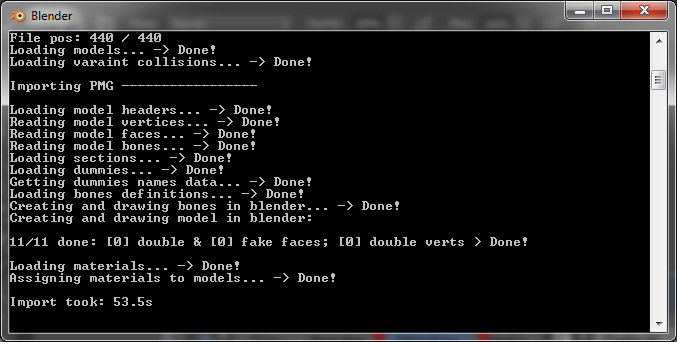 So, now that we have applied our materials to all Models under DEFAULTPART, we are ready to . . . . do it some more. Don’t kill me, though. We’re almost done!!!! Here’s some cool trivia. have you seen any of those third party mods that have animations when you hook up/unhook your trailer? Some trailers have cones that appear, some have rear doors opening. One I have seen even has a forklift appear next to it looking ready to lift something off the bed! These are all the result of a set of codes that ETS2 sees almost like a light switch. These are called "BRACE_OFF and BRACE_ON. BRACE_OFF is when your trailer is hooked to a truck. The jacks are raised. BRACE_ON is when the trailer is not hooked to a truck. Braces are down and the trailer is stationary. 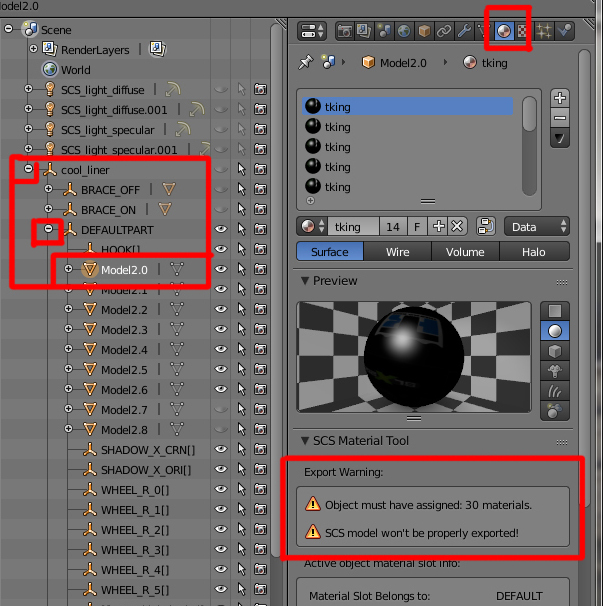 By default these two sections contain the model for the jacks/braces on all trailers. Creative modders that want to include other neat things like traffic cones, etc. when the trailer is unhooked can place them and assign them accordingly to the "BRACE_ON" section. But alas I digressed yet again to bring you some cool trivia about how things work in the game. Lets get back on track. You have to repeat the process as with above to make sure materials are assigned to all Model parts in BRACE_OFF and BRACE_ON. Go ahead and do this, and then relish in the fact that you are about to complete this entire project! 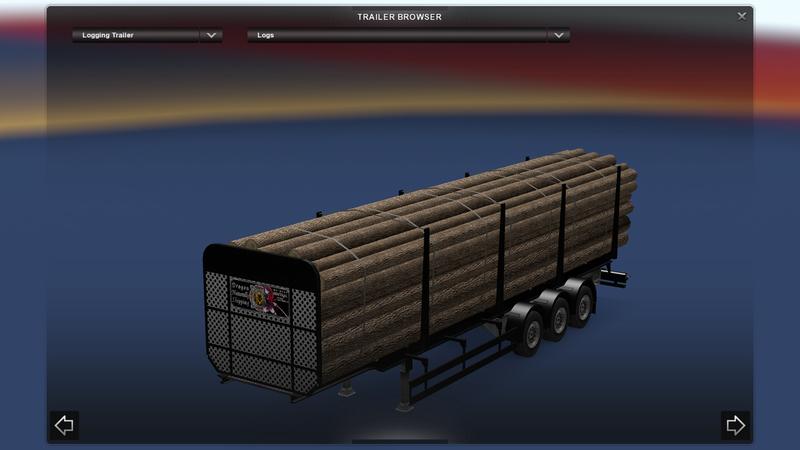 We imported a trailer that we want to replace a default trailer with in the game. 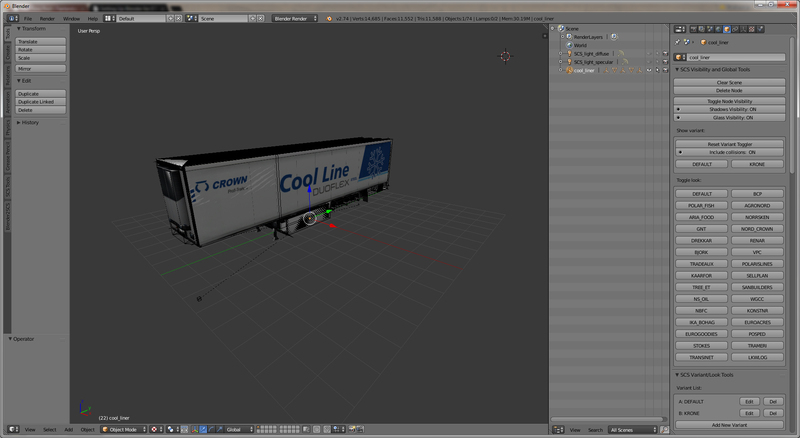 We changed the root name of the model to the same name as the trailer we are replacing (in this case cool_liner). We matched Variants and Looks to the trailer we are replacing. We assigned materials to all of the looks we created. 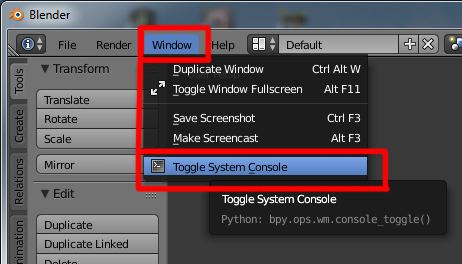 Before we export, I want to toggle a window that I love to have up at all times: The system console. 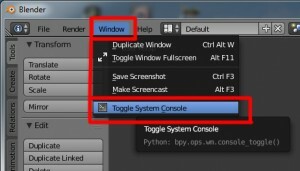 Toggle this on to have a separate window, which looks like a CMD window, appear. Our first step is very important. otherwise the model will not work properly in ETS2. On the left side look for the window that has, by default, "/model/blender_export". Change this to match the root directory of your trailer. In all trailer cases this will ALWAYS start with "/vehicle/trailer_eu/". In this case we are doing the Krone Cool Liner. 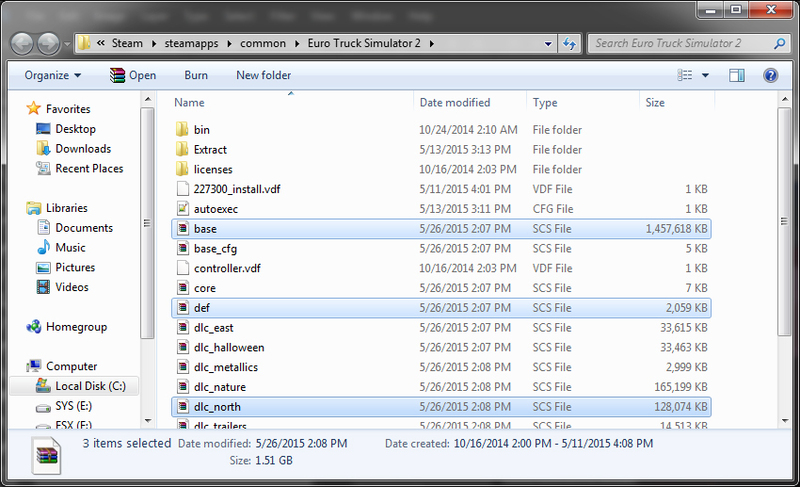 In ETS2 Krone and Schmitz are unique in that they have their own directories within the "trailer_eu" folder. All other trailers are simply located individually within this folder. 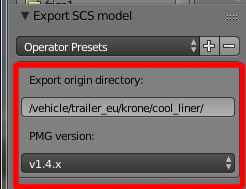 So for the "Export origin directory", to replace the Cool Liner, we need this path: "/vehicle/trailer_eu/krone/cool_liner/". Note this has the odd behaviour of other spots with a context menu. If you move your mouse off this choice, it will erase the folder name you just tried to create, and you will have to retype it again and just press ENTER to make sure it sticks, without bumping the mouse. Oh . . . see below that directory where it says "untitled.pmd"? Ignore that. Or not. It doesn;t matter. You can type anything you want into that field and it will be ignored. 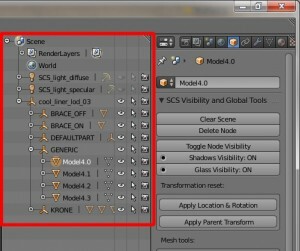 Be default Blender2SCS will force your file name to be the name of your model that we gave it from within the Outliner. 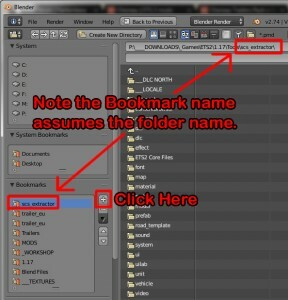 So no matter what you type here resulting file will still be cool_liner.pmd, pmg and pmc. Three files will be created. The pmd is your model. pmg is data ETS2 uses. And pmc is the collisions. This is it. Drum roll . . . . or whatever sound turns your engine crank for anticipation! Click it . . . you know the button . . . ‘Export SCS model" (it is to the right of the directory field at the top). Depending on the speed of your PC, mainly in the area of processing power, the export could take a bit. For me most trailers take about 10 – 15 seconds to export if they are as high quality as the Chereau. 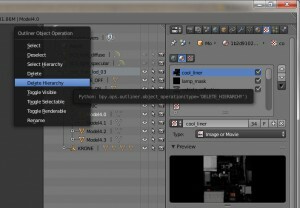 Default trailers take 1 – 2 seconds to export. So it really depends on the quality of the model, processing power of the PC, and other factors such as hard drive speed, etc. Again, do NOT close this box via the red X. This is a bad thing – ESPECIALLY if we had errors or need to somehow revise our work! P.S. 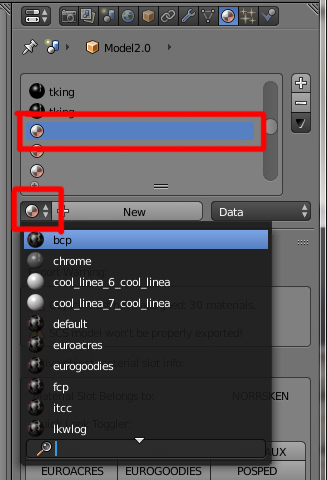 – if you are a save often type of person like I am, you CAn save your work periodically as a .blend file. Simple go to File–>Save As and name your file whatever you want! 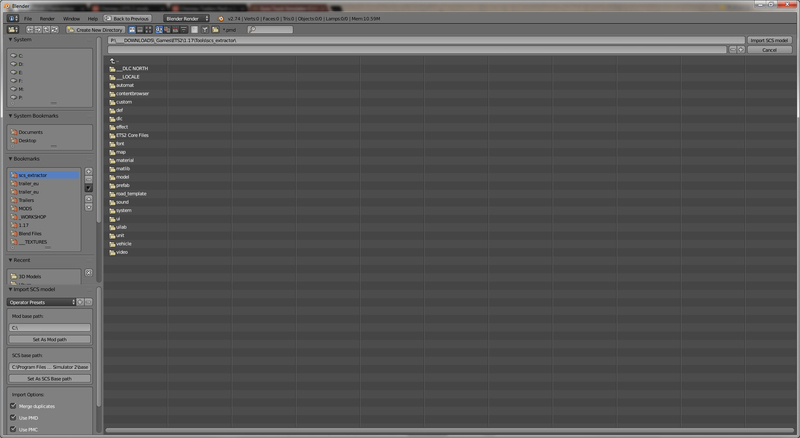 Now let’s check the export directory to make sure our files exported correctly. There SHOULD be 3 models and two folders – once for materials and one for textures. If it looks like this, we are in business! Oh come ON! Don’t look at me like that. We still have the LOD models to do. Remember earlier how I stated that the game uses LOD models to render at various distances? 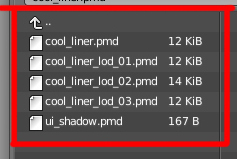 In the game, the cool_liner.pmd is also shadowed by existing LOD models. SO! We have two choices! If your third party trailer has an already existing LOD model, we can import it, and repeat this ENTIRE painful process over again OR . . . if you have a good PC like mine that cane handle high detail in games . . . let’s cheat . . .
Do you see how there are 3 LOD models? Now go back to your custom trailer Blender and select "cool_liner" in the Outliner window. Double click to be able to rename this part. All of the models start with "cool_liner", so we do not have to delete this. 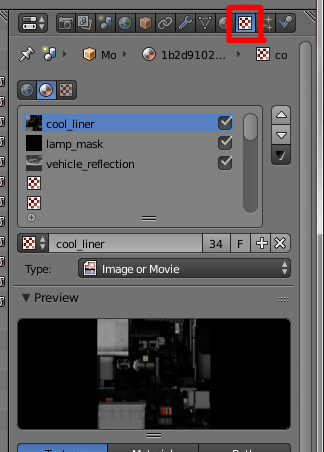 just add "_lod_01" to the name so it appears as "cool_liner_lod_01". Once it is typed correctly, hit ENTEr to apply the change. Now, lets export again! 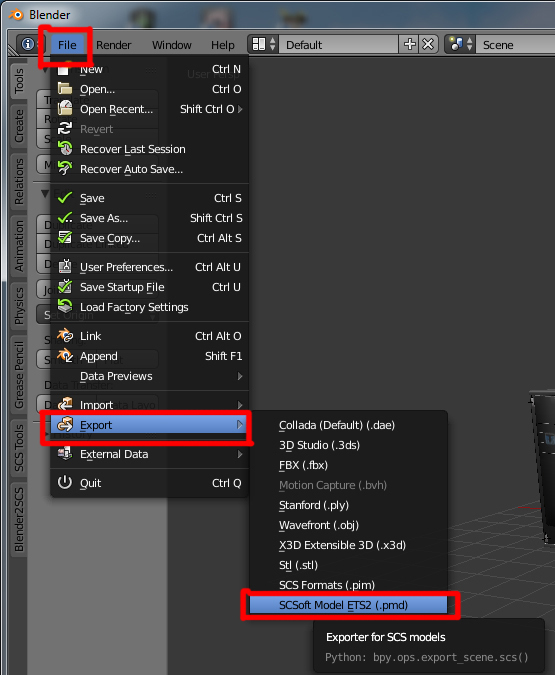 Since we are still using the same instance of Blender, our prior information should still be filled in for "Export Origin Directory", "PMG version", and root directory. 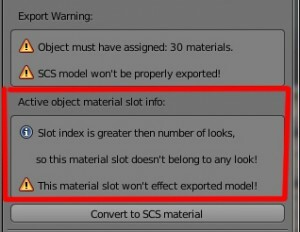 So simply verify this and again hit "Export SCS model"
ahain, verify the export was error free, and check the directory. Notice something? Yep! 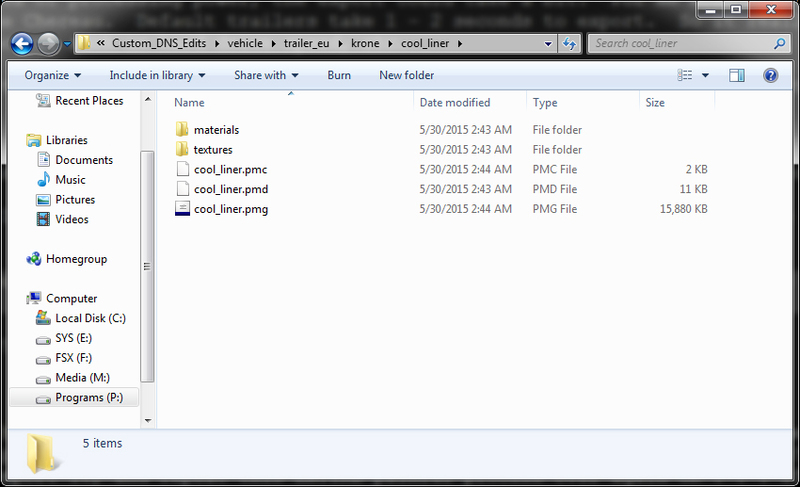 It created three new files, all named for our LOD model! Now, repeat the process just like this for "cool_liner_lod_02" and "03" respectively. Will using such a high detail model as LOD models effect performance? Yes – it will. it will also yield an odd effect of sometimes as you approach from far away it looks like there are no tires on the trailer, then they appear as you get closer. It is not ideal, but it is a choice of either this, or having the DEFAULT cool liner appear until you get really close, so you would not even know this is YOUR trailer until you were close enough to almost touch it! This is even less ideal. 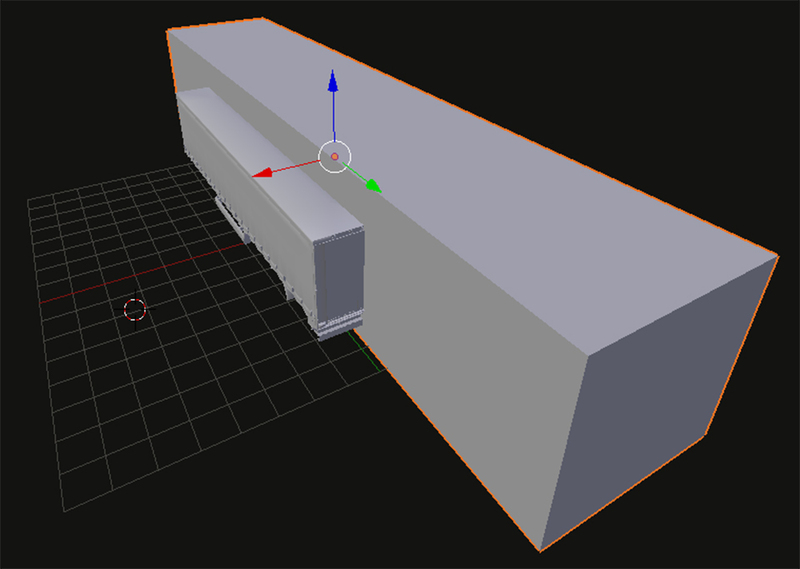 Fortunately, using a high detail LOD model is good as a place-holder until you can either create or find a sufficient LOD model of the same trailer. So, what about ui_shadow.pmd? Ignore it. 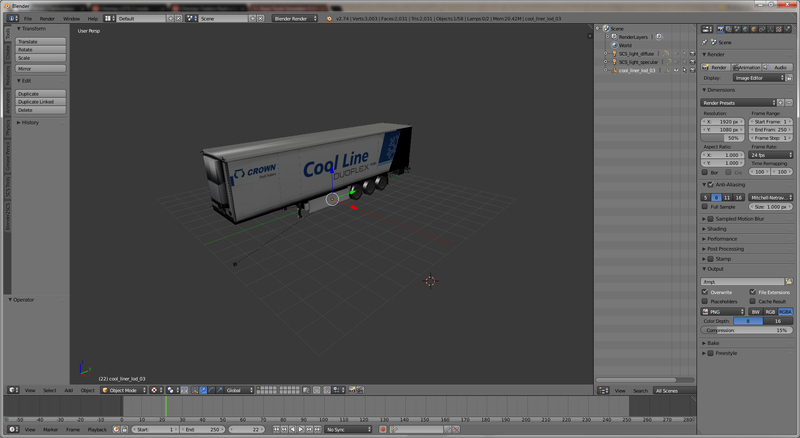 The Chereau and the Cool Liner are the same size and orientation, so they can realistically share the shadow file. 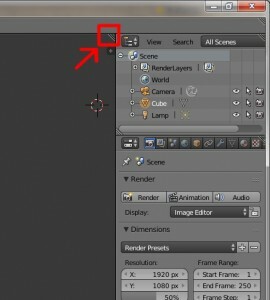 Leave it be and the trailer will use the default shadow and you won’t see a difference. Now, for the final part of this lesson, I will teach you how to package these files into a mod using WinRAR. From the directory where you extracted your models, go UP until you are in your root directory. 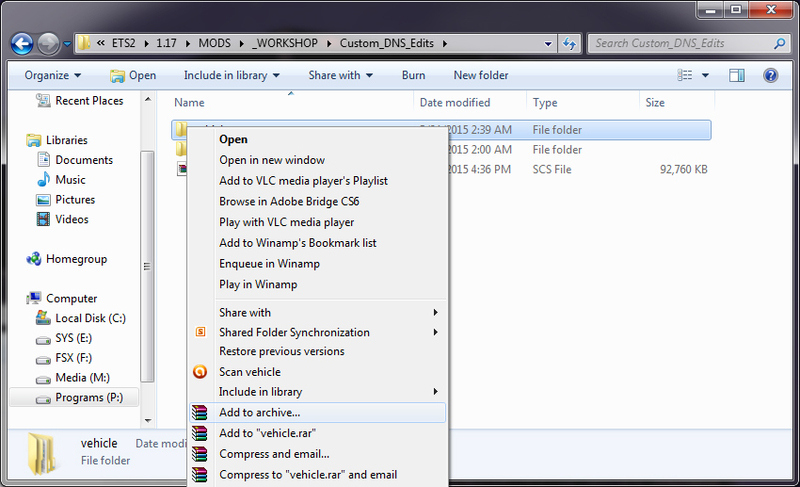 This is where you will simply see a folder named "vehicle". Selecte it, then RIGHT click and select "Add to Archive". Change Compression Method from "Normal" to "Store"
Change the extension of the Archive Name from . 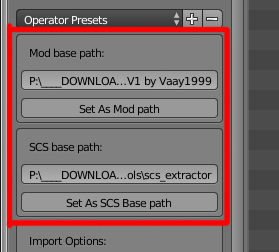 ".zip" to ".scs"
If it looks like that, exactly, then click "OK"
Now in your directory, your mod should be created. Under type it should say "SCS File". I can now rename this file anything I like, and "vehicle" is so vague, so I’ll name it "ZZZ – DT – DNS Fleet". 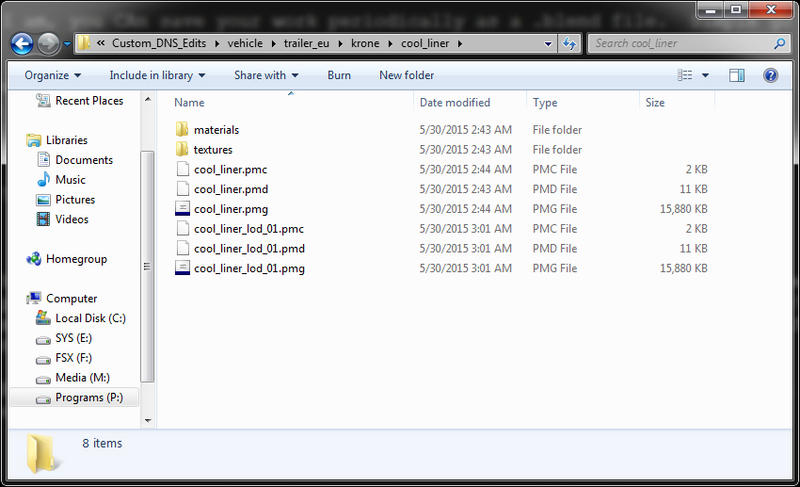 As I add other trailers, I can include them in this same mod – adding them the same way you’d add any file to a RAR or ZIp folder. The "ZZZ" places it at the bottom of my mods list, assuring that this mod overrides any other mods that replace or edit the default trailers. I also use a coding system in my mod directory, using 2 or 3 letter codes to tell me what type of mod it is. In this case, "DT" means this is a mod that effects Default Trailers. This is not necessary, but if you are like me and have dozens of mods in your mod folder, some organization is really good to have. Now we have our mod created and ready to go. Only one thing left to do! Copy it into your mod folder for ETS2, activate it in game, and select Freight Market. Your new trailer should immediately appear. Since we REPLACED an EXISTING trailer, we do NOT have to "sleep" or fast forward game time to see if the new trailer shows up. If it does not appear immediately, and you still see the default Krone with the default paints, then something went wrong somewhere, and you’ll have to backtrack and find out what went wrong. In this case, most likely a filename or directory name typo that does not match the default trailer file names or root directories. Now, why are you still reading this? Get into ETS2 and enjoy your new trailer!